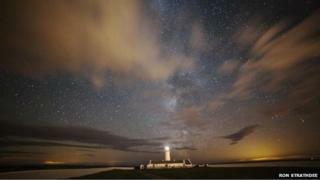 Isle of Man becomes star gazing "centre"
The Isle of Man is set to be a centre for British star gazing after receiving an award from a UK research body. The Science and Technology Facilities Council (STFC) has identified a further 19 Manx Dark Sky Discovery Sites, in addition to the seven already credited. New areas included on the list include Cregneash and Peel Castle. Howard Parkin from the Isle of Man Astronomical Society said the lack of light pollution has been key to achieving the international status. He added: "This award means we now have the highest concentration of Dark Sky Discovery sites in the whole of the British Isles. "Light pollution means that more than 85% of the British population has never seen a truly dark sky, but with a low population density and few built-up areas, the Isle of Man provides the perfect spot for stargazing." In October 2012, seven sites on the island including Smeale Nature Reserve, Niarbyl and The Sound were given Dark Sky status - the remaining 19 accreditations were announced by the STFC on 6 January 2014. According to the STFC, Dark Sky Discovery Sites are given the status on the basis of being "accessible and free enough from light pollution to get a good view of the stars". In England, the network has been supported through a Big Lottery Fund grant awarded through Natural England's Access to Nature programme. In order to be listed as Dark Sky Discovery site, a venue must have good public and disabled access, permission from the landowner and the Milky Way must be visible from the area. "This is the second step in a three part process," added Mr Parkin. "I think the Isle of Man should now push for international Dark Sky accreditation - I look forward to the island developing as a key astronomy destination." Internationally recognised Dark Sky sites in the British Isles include Sark island, Exmoor and the Brecon Beacons.